1. Mary is our first and most important saint because of her special relationship with Jesus. 2. The Communion of Saints means all the members of the Church - living now, in purgatory and in heaven. 3. The choices we make on earth affect what happens when we die, we will be judged on our choices. Please have a look at these links in order to make comments at our meeting. Read the theology for the Communion of Saints at the beginning of your strand book. Be prepared to discuss this at the meeting. Be prepared to give a quick overview of the Communion of Saints strand at your level. Also be prepared to share something you have done or could do as a learning activity at this level or another level you have taught at - something which will also enliven the spirituality of your students. 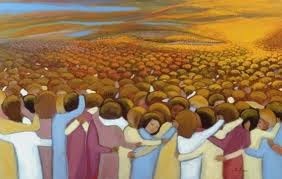 If you have any resources or links that you use for the Communion of Saints please share them in the resources folder drop us all an email link when you do please. At the meeting we will make a "graduate profile" for the Communion of Saints strand and write an assessment.